My garden will be on tour in a couple of weeks to benefit the Barnstable Education Foundation. As I bustle around making sure that things look spiffy it occurs to me that others may appreciate knowing what to do in similar situations. If you’re planning to open your property for a garden tour, here are a couple of hints. 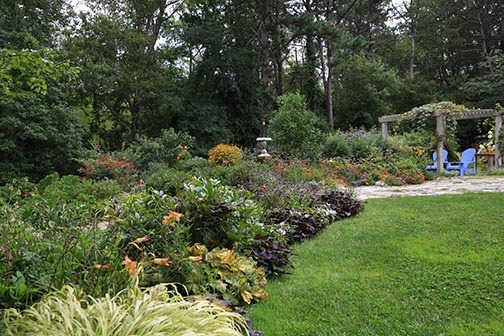 Many garden tours happen early in the summer, but some gardens actually look their best later in the season. Before agreeing to having your garden on tour, review photos of how the garden looked during that period in the past. 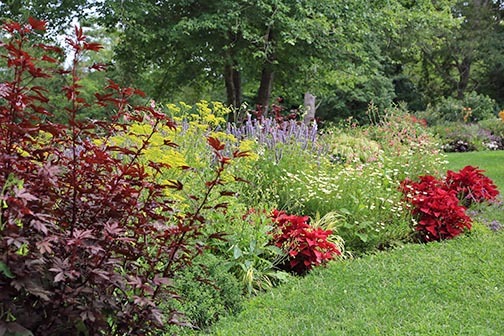 Here is part of the lakeside border as it will be when my garden is open on Sept. 14th. Since my gardens are open later in the season I know that visitors will enjoy the many annuals I put in. This summer I planted a vibrant border of marigolds, scaevola, and Frosty Knight Lobularia. I'm so pleased with how this combination turned out and I look forward to sharing it with others. 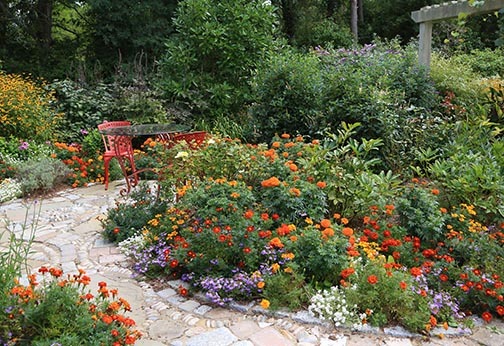 If your garden will be on tour in late summer, be sure to plant annuals early on. Don't sweat the small stuff. It's tempting to try and make every area absolutely perfect but you'll drive yourself nuts if you go down this path. 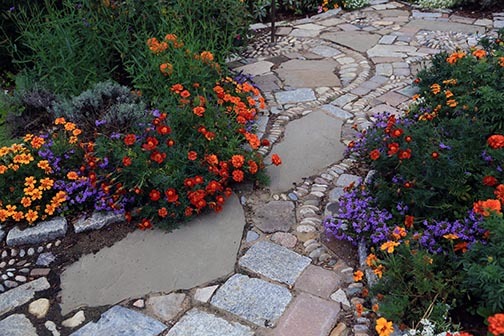 Tackle the big areas and keep the gardens weeded...those smaller spots that you consider less-than-perfect won't stand out and most won't notice them at all. Don’t water the lawn right before your tour. Water the turf well two or three days before and then turn any irrigation system off until right after your tour. Wet ground will be compacted by many people walking over the ground and this will do damage. If some of your plants unexpectedly die and there are bare areas that you want to fill, visit your local garden center for fill-in annuals. Hanging baskets make good fillers…just pop the plants out of the hanger and plant them in the ground. Hanging baskets are also good for instantly filling pots and urns. These can be placed in the garden or elsewhere for instant fillers and color. Don't forget to relax and have fun on the day of your event!